This post was originally published on March 7, 2018. 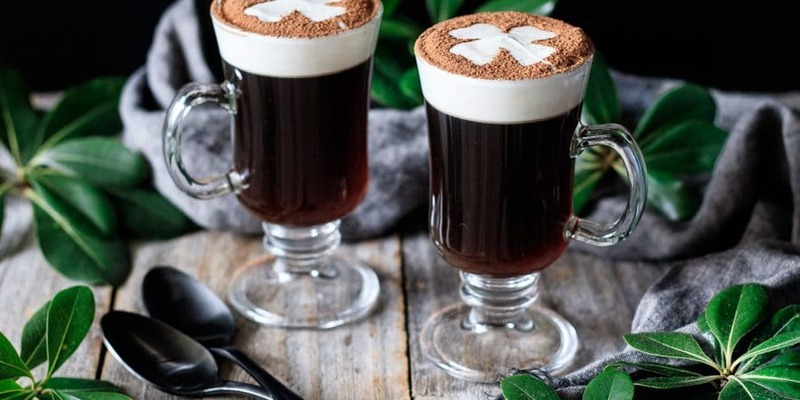 The one drink you need to make this St. Patrick’s Day is this non alcoholic Irish coffee. It’s quick to make, and takes just a few ingredients! When you take a sip, the coffee flows through the cream floating on top. It feels so fancy–but it’s actually easy to do. 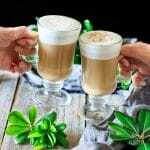 Is there alcohol in Irish coffee? 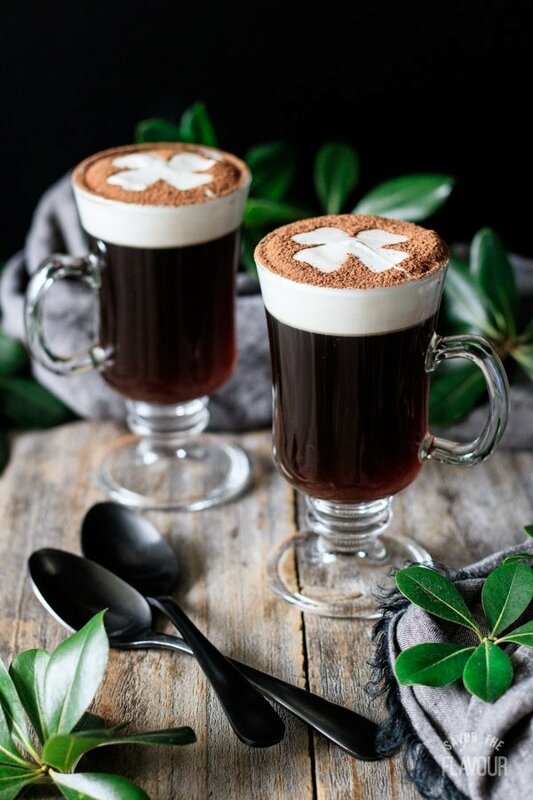 Traditionally, Irish coffee is made with Irish whiskey. There’s no alcohol in my version, however. 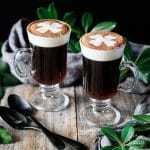 Is Irish coffee served hot or cold? 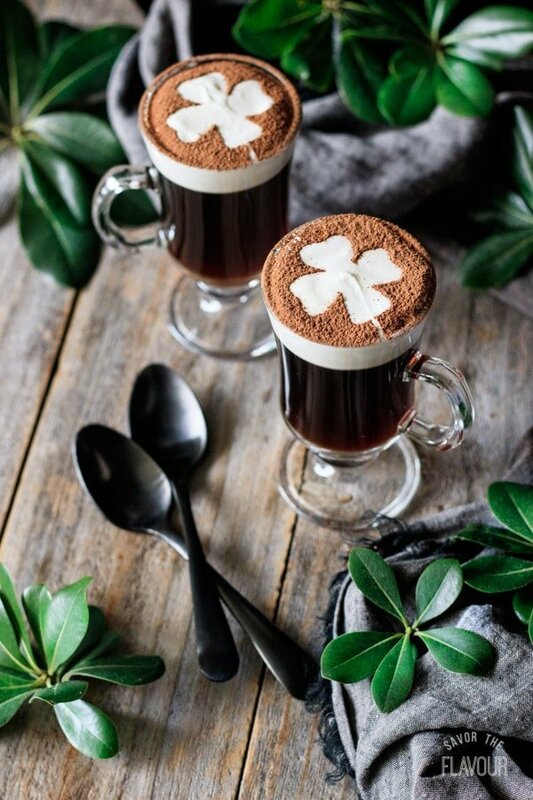 Irish coffee is traditionally served hot to allow the sugar to dissolve in the coffee. It tastes the best while the coffee is hot and fresh. Yes, you’ll need to stir the coffee to dissolve the sugar and disperse the rum extract, then you’ll pour the whipped cream on top. Be sure to let the coffee stop swirling before pouring the cream on top! 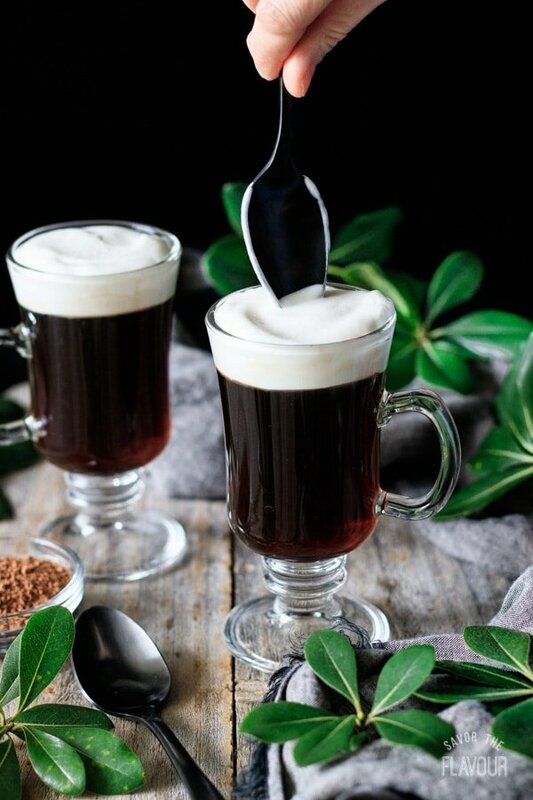 How do you drink Irish coffee? Just sip it as you normally would for a cup of coffee. The sweetened coffee will flow through the layer of cream on top as you drink. Joe Sheridan, a chef and bartender at the Flying Boat terminal in Foynes, Ireland, invented the Irish coffee in 1943. 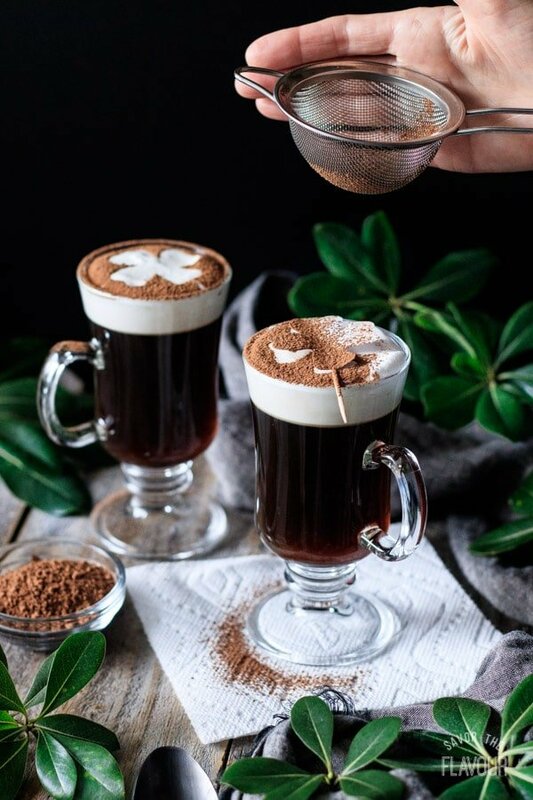 A plane was forced to return to the terminal because of bad weather, and Sheridan made the Irish coffees for the chilled passengers to enjoy. They’ve been popular ever since. 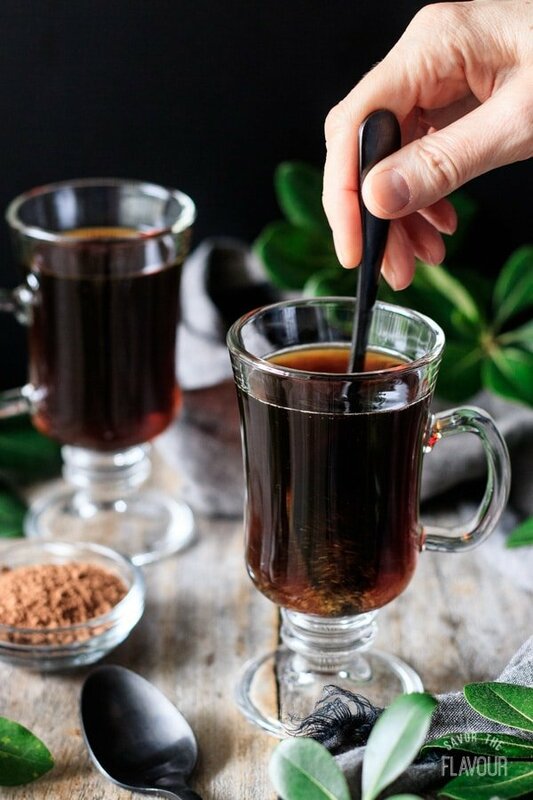 Gather the ingredients: freshly brewed hot coffee, rum extract, brown sugar, heavy whipping cream, and cocoa powder (for an optional garnish). 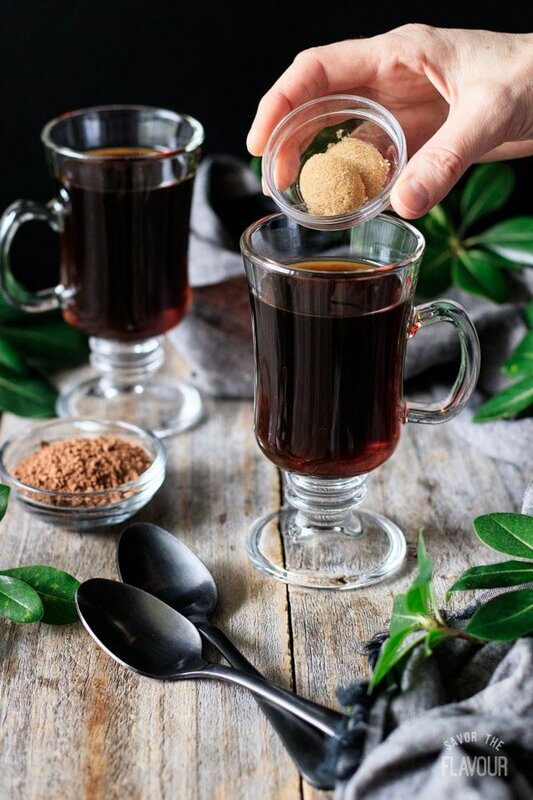 Pour the coffee, rum extract, and brown sugar into a glass mug. Whip the cream until thick and airy, but still pourable. 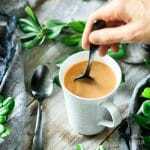 Make sure the surface of the coffee is perfectly still from being stirred, then pour the cream over the back of a spoon. The cream should float perfectly on top of the coffee. Smooth out the cream if needed with a spoon. 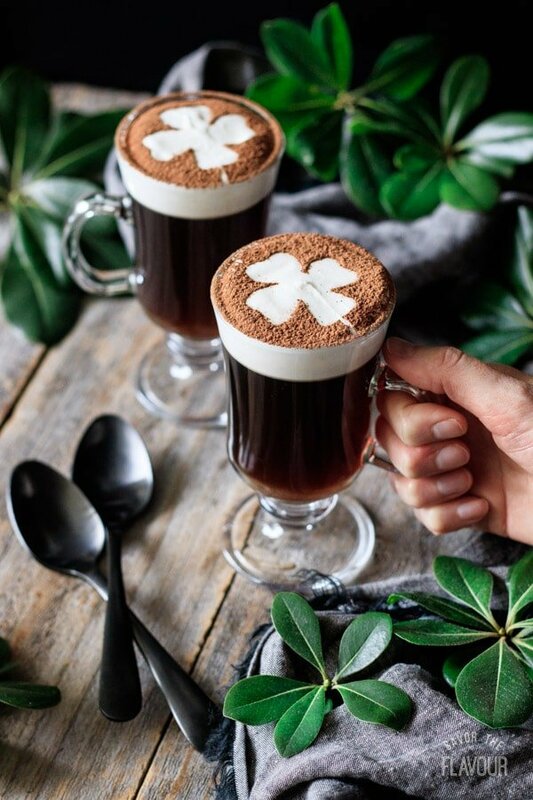 If desired, use a stencil to create a cocoa powder design on top of the Irish coffee. 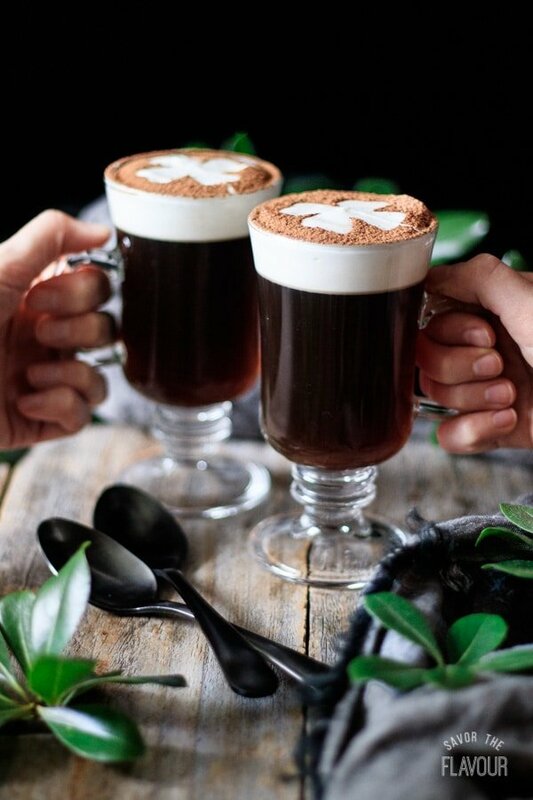 Enjoy while the Irish coffees are still hot. Are you ready to try this out? You’ll need to make this for St. Patrick’s Day this year! Use strong, freshly brewed coffee for the best flavor. Use caffeinated or decaf, whichever you prefer. Adjust the amount of rum extract to your personal taste. 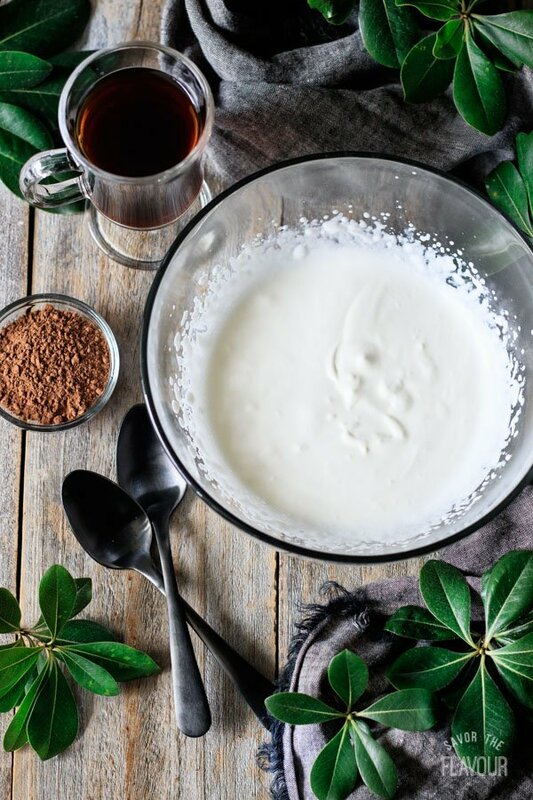 Be sure to use real heavy whipping cream that you’ve whipped yourself. Cool Whip and Reddi Whip will not be good substitutes. Pour the whipped cream over the back of a spoon. This keeps the cream floating on top of the coffee. Do a practice coffee to check your cream-pouring skills. Go slow–you can always make another one! These other coffee drinks will have you coming back for a refill! 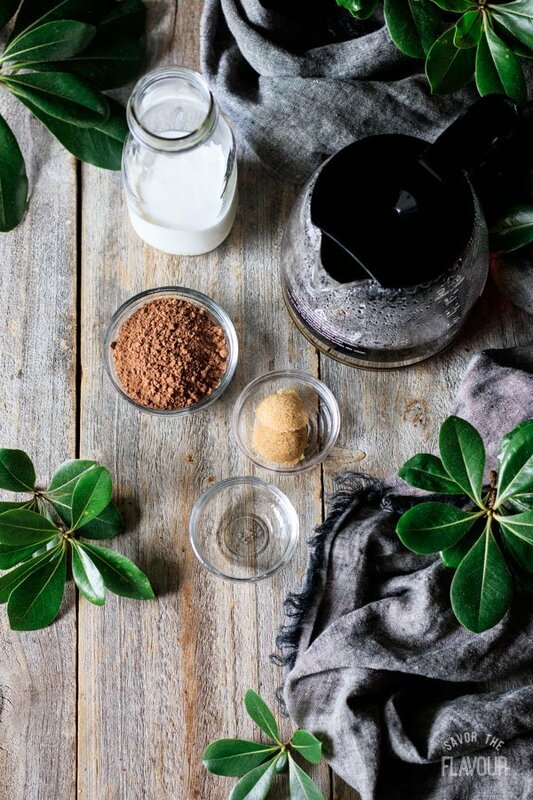 How to Make French Press Coffee: make the best coffee you’ve ever tasted with these top tips. Smoked Butterscotch Latte: this Starbucks copycat recipe is simple and delicious. Pumpkin Spice Latte: make your own PSL anytime of year with this easy and tasty recipe. 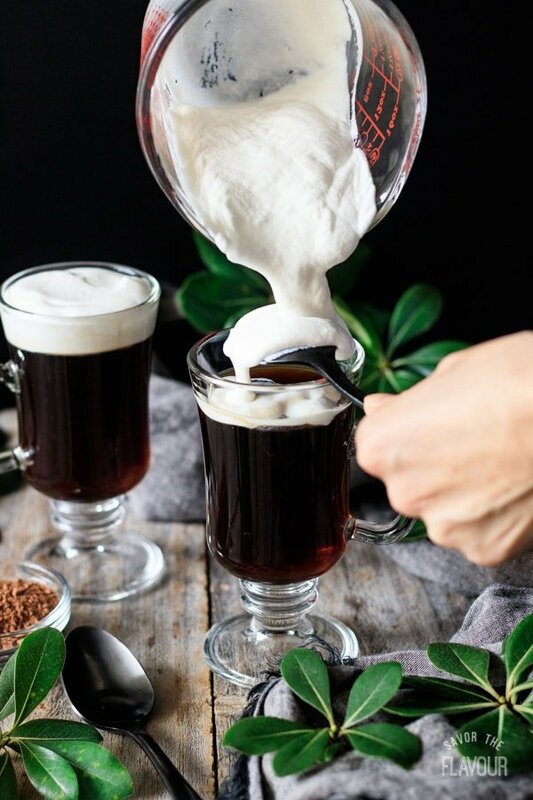 Did you make this non alcoholic Irish coffee? Please leave a star rating below to share how you enjoyed it.